Where will Kevin Durant go in free agency? We examine all of the Thunder's stars possible options and the conspiracy theories that are out there. It's the end of March. Teams like the Nets are rolling out players we have never even heard of before, and the top of each playoff bracket has been set for months. I can't pretend that there is any pressing basketball news to discuss this week. I'm currently at the "bored by all these games and reading way too many Donald Trump think pieces" point in the NBA regular season. So, it's time to mix it up. Let's go the dark side. It's time to talk about Kevin Durant's free agency. Where will he go? What's in play? What conspiracy theories are out there? • I really don't think KD has any idea what he'll do this summer. In other words, as of now, there is no correct answer to "Where is Kevin Durant going?" • I do think his agents at Roc Nation have been in touch with prospective teams, and are prepared to meet with anyone. In other words, the second–best player in basketball is very much on the market this summer. •​ The salary cap isn't set until the end of June, so we're using rough numbers for some of these projections. • There are no specific details on Kevin Durant's rumored $350 million Nike deal, so we'll use this Wall Street Journal article. • We didn't mention the Knicks, because that's too crazy. •​ We didn't mention the Spurs, because that's too evil. • Some may call it taboo to speculate on all this while games are still being played. Others would call it clickbait, or, worst of all, First Take fodder. I want to be very clear: These criticisms are all valid and 100% accurate. Working theory: They can pay him the most money, and they give him the best chance at a title that doesn't involve selling his soul to Steph Curry. Also, if he stays an extra year in OKC, he could still leave next year, and as a 10-year veteran, he'd be eligible to sign a max deal and be paid 35% of the highest salary cap in NBA history ($38 million-a-year if the salary cap is around $110 million, as expected). While fans around the NBA put their faith in conspiracy theories, OKC's argument comes down to common sense. 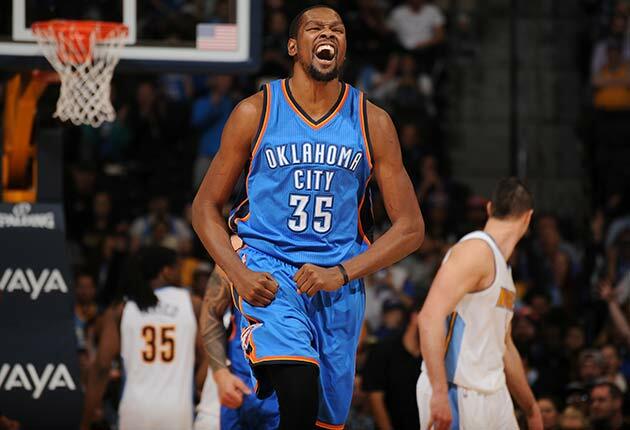 OKC has his Bird Rights, meaning they can exceed the salary cap to sign him this summer. Also, any team he goes to this summer won't have Bird Rights for at least another two seasons, which means that new team could only offer 4.5% annual raises compared to 7.5% raises in Oklahoma City. And with no Bird Rights, the team would have to re-sign Durant under the regular cap without exceeding the luxury tax (if he opts out in a 1+1 scenario). That paragraph is incredibly confusing, but the important takeaway is this: It's simpler to stay in Oklahoma City. He can make the most money by waiting until next season to sign a long-term deal, and if he's waiting a year to commit, he may as well stay with the team he knows. Holes in the theory: There have been so many smart people who've mentioned the one-year OKC deal as though it's a foregone conclusion. They don't just predict that outcome, but they imply that anyone paying close attention to the numbers would see it's clearly the best option. Is it, really? Compare the salaries of Durant signing a four-year deal somewhere else vs. a one-year deal in Oklahoma City and a five-year deal in Oklahoma City, and sure, you can make it look like this is something like a $75 million decision. But this assumes Durant would sign a four-year deal with a new team. It's probably more likely that he'll sign a one-year deal wherever he goes, giving him another crack at a deal once he becomes a 10-year player who can sign for 35% of the cap. Even then, he may go one-year again so that he can secure early Bird Rights from his new team before signing long-term. If he does that—and the new CBA remains favorable to superstars—the difference between OKC's salary and that of a new team would likely be mitigated over time. Could he make more money staying in OKC for the next six years? Yes, because Bird Rights give OKC the power to offer raises that other teams can't. Over the lifetime of a one-year deal plus a five year-deal with the Thunder, it could be a difference of about $30 million. That is A) one year of Nike salary, and B) roughly 15% of what will likely be a little more than $200 million salary over the next six years ... about the same percentage of salary that LeBron sacrificed to leave Cleveland in 2010. Any superstar who leaves in free agency will be leaving money on the table with his old team. $30 million is a big number, yes, but so are all the other numbers in play here. With contract values approaching $200 million and a shoe deal worth at least $300 million, it's probably a mistake to expect $30 million to decide anything. A Better OKC Theory: Durant may just want to make another run with Westbrook and Ibaka before he leaves for good. He's familiar with the roster, and he genuinely seems to like everyone in OKC. If Durant looks around and doesn't find any fit that makes sense, one more year in Oklahoma City is probably the safest bet. This—probably more than the contract advantages—is why the Thunder are the favorites. Working theory: This makes sense for Golden State. While it's true that a) they are currently putting together one of the greatest seasons in NBA history, and b) their crunch–time lineup often appears to be a perfect five-man unit whose accidental chemistry has cracked the code to basketball, it will be hard to keep things the same after this season. The Warriors will have to pay Harrison Barnes way too much money to keep the core in tact. Likewise, Andre Iguodala and Andrew Bogut are getting older. Festus Ezeli will be eligible for a new deal. There could be changes up and down the roster. So, of course they are planning on a Durant run. He is the simplest answer to an off–season full of difficult questions. As real life catches up with the current roster, adding Durant would keep things nice and supernatural for the next few years. And if Golden State makes a run at Durant, of course he'll listen. San Francisco is a great city, and if winning a title is what Durant wants next, the Warriors give him the best chance of anyone. Holes in the theory: For one, the Warriors really would have to gut their roster to make this possible. 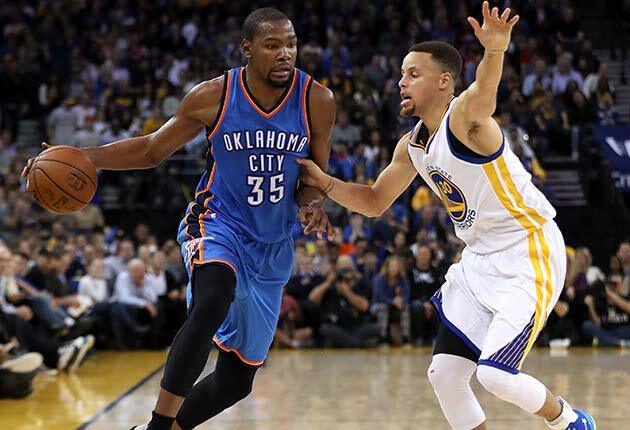 It's a significant risk on Golden State's part, and it would be a risk for Durant, too. He'd be coming into Steph Curry's team, likely following a 73-win season, and costing them key contributors like Bogut and Iguodala. Meanwhile, there'd be the pressure to not just keep things going, but to somehow improve on perfection (while not screwing up some of the greatest chemistry the NBA has ever seen). It's a lot to handle. Also, how would Nike feel about all this? As Ethan Strauss documented for ESPN last week, Steph Curry and Under Armour are currently waging war on Nike. It's hard to say how much influence a shoe company has with any player, but it's hard to believe Nike would want its second–biggest client to go play in the shadow of its biggest competitor. Finally, while this outcome is certainly possible and arguably rational for both sides, it has to be noted that this would be LAME. Durant is too good to join forces with the best player in the world. In Miami, Wade and Bosh and LeBron were at least friends beforehand, and the Heat were barely a playoff team when they all teamed up. Durant would be going to Golden State after possible back-to-back titles. It would be shameless ring chasing the likes of which we've never really seen from a superstar in his prime. I would watch every second of it, but it would bum me out. Working theory: This song is about Pat Riley. Miami is Miami, and South Beach is powerful. If the Heat make a run in the playoffs, there will be all kinds of momentum heading into free agency. Don't look at the numbers, because the numbers don't even matter. Riley will leave no stone unturned until he's smiling next to Kevin Durant at a press conference while the rest of the world burns. Holes in the theory: OK, but maybe look at the numbers: How much do they pay Hassan Whiteside? 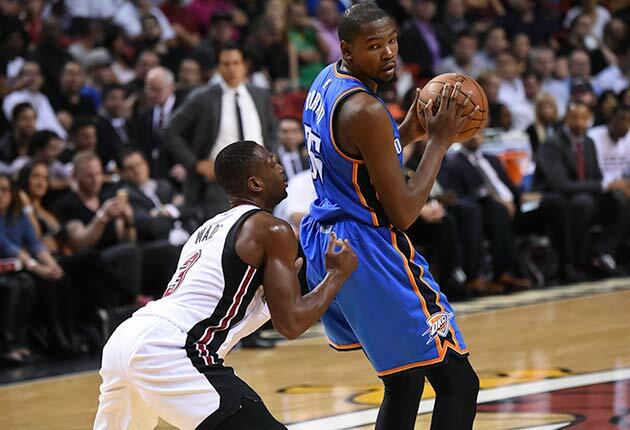 How do they keep Dwyane Wade if they also want Durant? Can Chris Bosh continue his career? Will it make sense for a superstar to tie his fortunes to the next four years of Goran Dragic? There are too many questions. Nobody is doubting the power of Keyser Söze​/Tywin Lannister/Pat Riley—remember, he issued an official statement telling Danny Ainge to "shut the f--- up"—but this is a longshot. Working theory: THE DREAM ISN'T OVER UNTIL YOU WAKE UP. Holes in the theory: As someone who once actually believed the Wizards were getting Kevin Durant—and heard it was realistic from a few people who would actually know—let me be the first (last? loudest?) to say KD2DC will not happen. The idea made sense, but the execution was doomed by misguided loyalty to Randy Wittman and bad injury luck. For the record, the logic behind all this began with the roster in DC, the same way the Cavs roster is what ultimately brought LeBron James back to Cleveland. Paired with John Wall and Bradley Beal, it looked like the Wizards could give Durant a chance to own the East for the next decade. But that was about 18 months ago. Now... Wall looks better than ever, but Beal hasn't been able to stay on the court, and nothing about the Wittman regime screams stability. Would you trust your future to this team? There's always a chance something crazy could happen. The Wizards could land the No. 1 pick, Ted Leonsis could hire every basketball coach Durant has ever had... Anything is possible. But for now, the biggest problem is this: Playing at home comes with pluses and minuses for any player. 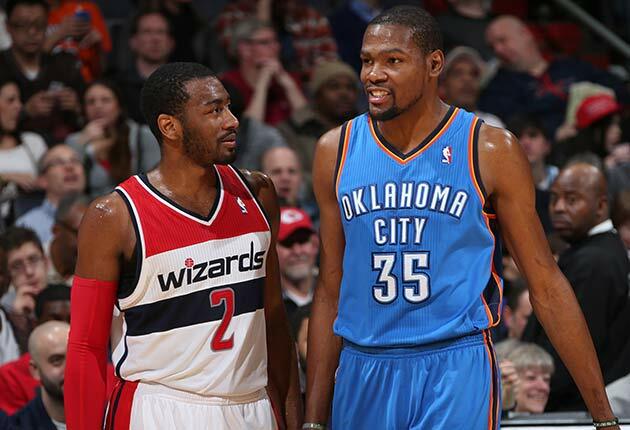 When the Wizards were surprising teams in the playoffs and looked like they had one of the brightest futures in basketball, going back to DC probably looked great to Durant. With the Wizards skidding to No. 10 in the East right now, going back home probably looks like an unbearable amount of ticket requests, crazy expectations, and horrible traffic getting from Maryland to Chinatown. Working theory: Durant spends most of his off–season in Los Angeles. 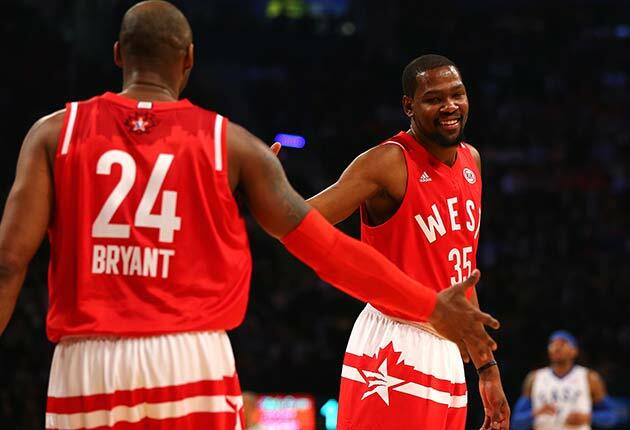 He admires Kobe Bryant—they had dinner together earlier this year, and after lashing out at the media's treatment of Kobe, Durant said that the Mamba was his "idol." There's at least a chance that the Lakers have a real appeal to Durant, who wants to enjoy life in L.A., follow in his idol's footsteps, and help build a contender. There are more variables in this plan that could either hurt or help the cause. For instance, if the Lakers get a top–two pick, that will give them even more recruiting tools to lure Durant. Maybe he wants to play with Ben Simmons or Brandon Ingram, or maybe he'd prefer they trade that pick for another star. Likewise, assuming Byron Scott is gone after he puts the finishing touches on the greatest stealth tanking operation we have ever seen, the next coach will be another factor to consider in the Durant pursuit. It's hard to say how this will work, but the foundation of the theory is actually pretty simple. If there's ever an off–season move that seems cosmically unfair and impossible to explain without invoking the illuminati, the Lakers will do it. It happened with Worthy and Magic joining Kareem. It happened with Shaq's free agency. It happened when they drafted Kobe. It happened with the Pau trade. It happened with the Chris Paul trade, and when David Stern ruined that, they got Steve Nash and Dwight Howard instead. I'm just saying, it could easily happen with Kevin Durant this summer. Doubt the Lakers at your own risk. Holes in the theory: Come on, though. Have you seen this team for the past few years? "Turmoil" is underselling the environment in Los Angeles. This is like a Jerry Springer episode that never ends. They're currently in the middle of shaming D'Angelo Russell for leaking a video of Nick Young talking about cheating on Iggy Azaela. That's a real thing. Today's Lakers have all the deep-seeded dysfunction that comes with old money, but none of the wit and charm that helped earn it. Nobody knows who runs the team now, or who will run it in two years. Nobody trusts each other. Jim Buss could very well be the West Coast James Dolan. Byron Scott has been in charge for two full years, and at least some people in the organization seem to think this isn't crazy. As for the roster, D'Angelo Russell looks promising—current Swaggy P predicament notwithstanding—but there are questions about how to build around Julius Randle and Jordan Clarkson. It's hard to tell what the foundation really is, or where they will go from here. Maybe the future includes Kevin Durant? I wouldn't be surprised. But if that happens, please don't pretend it makes any sense whatsoever. Working Theory: Take all the dysfunction from the Lakers section, and replace it with one of the three best coaches in basketball, one of the most stable organizations in sports, and a roster that is one piece away from scaring the crap out of the whole league. Boston makes a lot of sense. As a Wizards fan, this would be heartbreaking. As a fan of Kevin Durant, I'm pretty sure this is the option I want the most. He'd be in the East, he would be going to team with as rich of a history as anywhere in the league, and he'd probably average 35-a-game playing in that offense. From a marketing standpoint, it would put him on an even bigger platform than he's had in Oklahoma City. From a basketball standpoint, it would allow him the best chance (outside of OKC) to max out his ability. The Celtics can clear enough space to sign Durant and another star—Al Horford?—and they'll also have the Nets draft pick for the next three years, ensuring that they can stay flexible as he gets deeper into his prime. If Durant decides that it's time to leave Oklahoma City and try something new, this is one of the only teams that actually has a credible a chance at building a team to beat the Warriors. It would be so much fun to watch them try together. Holes in the theory: Well first of all, it's happening in Boston, so maybe it's not that cool. As a friend wrote in response to last week's Celtics stories: "Everything you wrote is true. I just HATE that all this stuff is happening in Boston. If Jae Crowder were in, like, Philly, I would already have a jersey." Working Theory: If you're looking for a team that combines the appeal of both the Lakers and the Celtics, the Clippers come closest. It would take some work, though. Durant would have to approach OKC and tell them he's signing with the Lakers unless they engineer a sign-and-trade with Blake Griffin. Could that create a title contender that has a better chance than this year's Thunder? Consider: Nobody in the NBA guards Steph Curry better than Chris Paul. Nobody kills the Warriors more than Durant. And without Griffin the past few months, the Clippers have discovered a small–ball approach that has them hitting on all cylinders. The best offensive stretch four on the planet would fit in pretty nicely to that mix. The biggest weakness with this team's future is DeAndre Jordan, who is unplayable at the end of fourth quarters because of free throws. But if Adam Silver changes the hacking rules this summer, Jordan's skills become twice as valuable just as Durant makes the small-ball approach twice as deadly. It's not to say that any of this makes them title favorites next to the Warriors and Spurs, but if Durant wants to be in Los Angeles next year, this is probably his best title shot. Holes in the theory: The Durant-for-Blake trade has been an internet dream for at least two years now, and maybe it's too good to be true. Presti could easily see Durant's demands, look at the state of the Lakers, and call his bluff. Plus, Chris Paul has been supernatural for going on a decade, but at some point age will set in. Durant should be careful about tying his future to CP3's knees, to say nothing of Doc Rivers' management. A move to the Clippers would be a significant gamble, just like almost every other team on the board here. That's why OKC remains the favorite. Of course, Durant has been betting on OKC for the last nine years, and it hasn't paid off yet. Come July, it might be time to mix it up.